If someone were to ask you which cars have been built in Nashville, Tennessee, you might be forgiven for responding with the names of Nissan and GM vehicles. But the correct answer would not include either. The only vehicle ever built in the city of Nashville was built more than 100 years ago: the Marathon. Never heard of it? 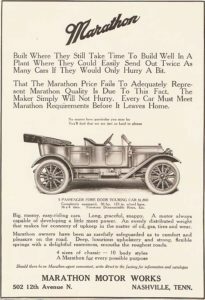 Not that surprising, considering that the Marathon was one of dozens of car nameplates that appeared and disappeared in the period between the late 1800s and the economic downturn of the Great Depression. 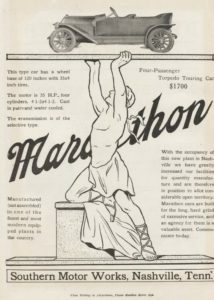 In fact, the Marathon only lasted seven years – from 1907 to 1914, but that’s not to say those weren’t exciting years for the automaker. But Collier and his colleagues didn’t give up. “Then as now it was common for auto manufacturers to outsource some of their components, concentrating on assembly and marketing, and perhaps manufacture of a few major systems. Southern Engine took a different approach however, and rather audaciously decided to engineer and build every single part of its car in-house,” Wikipedia reports. 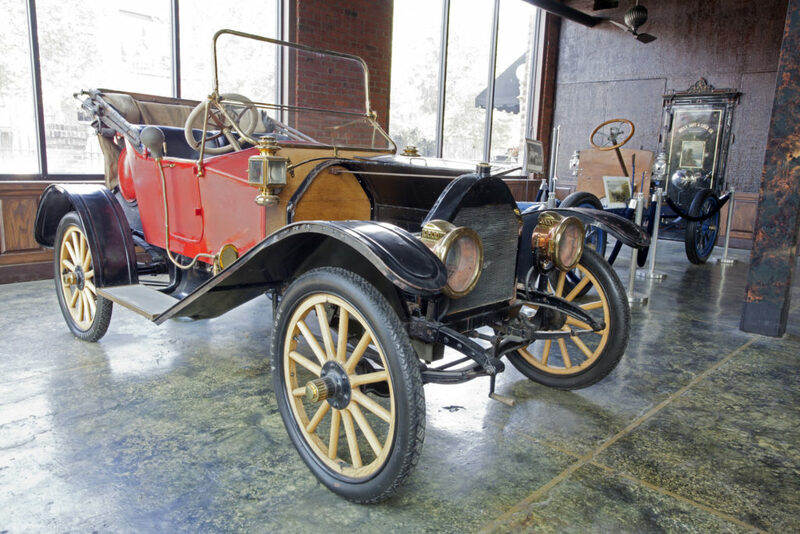 By 1910 Southern had successfully built 600 cars under that Southern brand, and attracted the attention of a Nashville businessman, and his investors, who bought the automotive concern, and relocated the operation to the former Phoenix Cotton Mill building. Because there was already a company making cars under the same Southern name, the company decided to change the brand of it’s expanding vehicle line. It spun off into the Marathon Motor Works – the name inspired by the 1904 Olympics (where the actual marathon was the weirdest of all the weird things that happened at the competition that year) — and from 1910 forward the cars bore that badge. In the end, production ground to a halt in 1914. The Herff Brothers and H.H. Brooks of Indiana, operating as Herff-Brooks Corporation, bought the assets of Marathon. Using some of the same personnel – Brooks had been a Marathon officer, himself – the company operated for a short time building the car in Indianapolis. But Herff-Brooks itself was out of business by 1916. Walker also devoted part of the space to a museum where he displays memorabilia and Marathon Motors cars themselves. It just demonstrates in a way, that like the name they bear, Marathons went quite a distance.